* It is too late this month to spot tiny MERCURY. Our neighbor is still rising before dawn but rapidly approaching the Sun, reaching Superior Conjunction on November 18. Afterwards it will make its first apparition in the evening sky in late December 2015. VENUS, MARS and JUPITER are still rising in the east before the Sun in the month of November. Venus will rise two hours earlier than the Sun throughout November, offering an even better opportunity to observe our sister planet in her most beautiful morning glory. Mars and Venus will closely align on November 3 and afterwards separate, with Mars rising earlier and earlier throughout the month, until he will be up a whole three hours before the Sun by the end of November. Jupiter also will rise bit earlier every day, two hours before the Sun at the beginning of November and over three hours at the end. The Waning Balsamic Moon will align with Jupiter on November 6, with Mars on November 7 and Venus on November 8. Here is a snapshot of the eastern sky on November 7, around 4.30 am (Eastern Australia Summer Time). SATURN will be difficult to spot in November, getting closer and closer to the western horizon in the evenings. He will in fact align with the Sun at the end of November, to turn into a Morning Star in December. The Waxing Crescent Moon will align with Saturn on November 13, a chance to spot faint Saturn before he disappears from view. 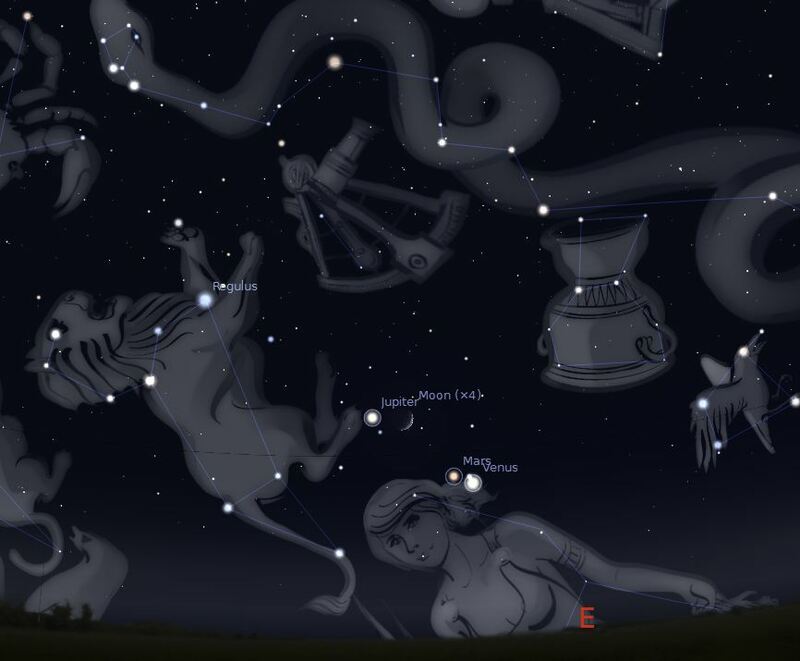 Here is the Stellarium’s snapshot of this event, looking West at around 7.30 pm. 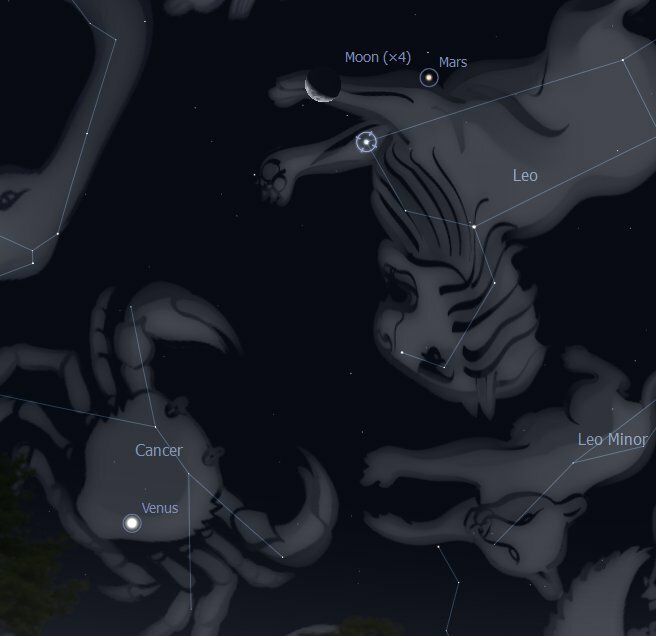 All the Sky Snapshots have been generated using Stellarium, a wonderful Planetarium freeware software. MERCURY has re-appeared as a Morning Star, very faintly at first, at the end of May. 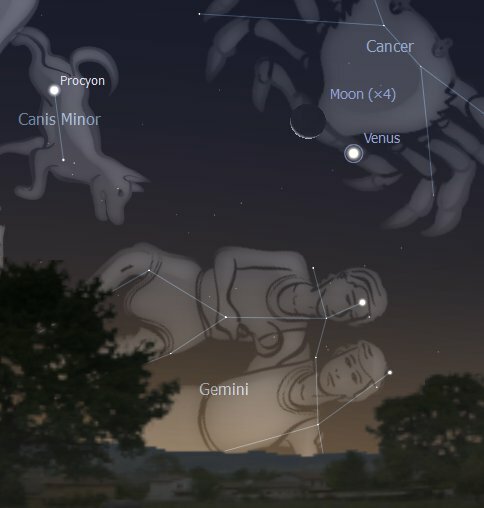 It will remain visible until mid-June, but very low in the eastern horizon in the pre-dawn sky, below much brighter and more elevated Jupiter, reaching its Superior Conjunction with the Sun on June 28. 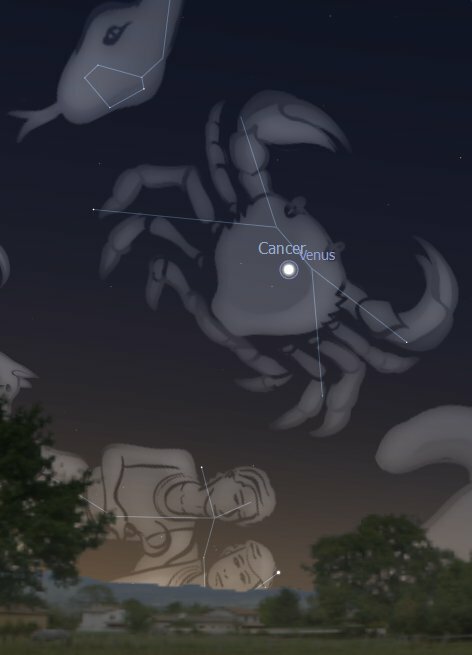 VENUS will trace her bright course between the Twin Stars Castor and Pollux (alpha and beta of Gemini constellation) until mid-June, setting with the Beehive Cluster in constellation Cancer by June 19 (find snapshots in the June Calendar of Observable Events, below). Our Sister Planet will remain the beautiful Evening Star until October 2010. In June it will remain around magnitude -3.9 (its maximum being -4), and also spend more time in the night sky, setting at 8 pm, three hours after the winter Sun (in Southern Latitudes), by the end of June. The Evening Star’s incarnation of Venus represents a collective opportunity to become more self-reflective, acknowledging our contribution to any relationship issues we may be experiencing. The Goddess of Love is looking deeper into our hearts and show us the way to a less self-centred and more aware kind of loving, (see also Venus in Cancer post). MARS‘ light keeps diminishing this month. 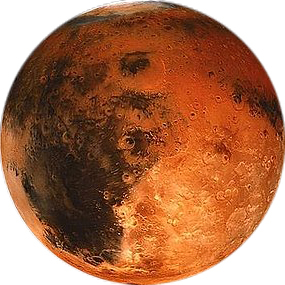 You can spot Mars in the evening in the North-West, relatively low above the horizon, reddish in colour, rising in daylight and setting just before midnight in mid-June. It will be easily spotted on June 6/7 when it will conjunct Regulus, alpha Star of Leo, and, again, on June 16/17 when it will be close to the Waxing Crescent Moon (find snapshots in the June Calendar of Observable Events, below). JUPITER, after emerging from the glare of the Sun in March, is now a very bright star, rising at midnight and very conspicuous in the east until sunrise, with the backdrop of the Pisces constellation. By the end of June Jupiter will rise at midnight. Jupiter will become brighter and brighter as the year advances, reaching its greatest brilliance in its whole 11.8 years cycle just in time for the Libra Equinox 2010 (September 21). This is due to the fact the giant planet will reach its perihelion, closest position in relation to the Sun, in March 2011. There is a companion to Jupiter in the pre-dawn sky, though invisible, so you will need a good pair of binoculars to spot it, 0.4 degrees above Jupiter. It is giant Uranus, spinning at right angle to everyone else, a bluish/green star-like object. Jupiter is -2.4 magnitude and Uranus at 5.8, dim but still the brightest object in the vicinity of Jupiter. Jupiter and Uranus are conjunct for the first time in nearly 14 years on June 9, and they are nearly as bright as they can be, their opposition from the Sun getting closer. It will be exact on September 22, just as the Sun prepares to enter Tropical Libra (Spring-Autumn Equinox), opposing them only five hours apart from each other. Jupiter and Uranus meet cyclically (synodic cycle) every 13.7 years. This time they are playing a prolonged duet, though, meeting twice in 2010 (June 9 and September 22) and a third time on January 2, 2011. This is a rarer opportunity for the energies of these planets to blend for a sustained period, so exerting a greater overall influence over the affairs of the whole year. The last time Jupiter and Uranus met three times was in 1983, 27 years ago. Animation of the triple conjunction of Jupiter-Uranus in 2010/11, from Martin J.Powell astronomical site, can be found HERE. 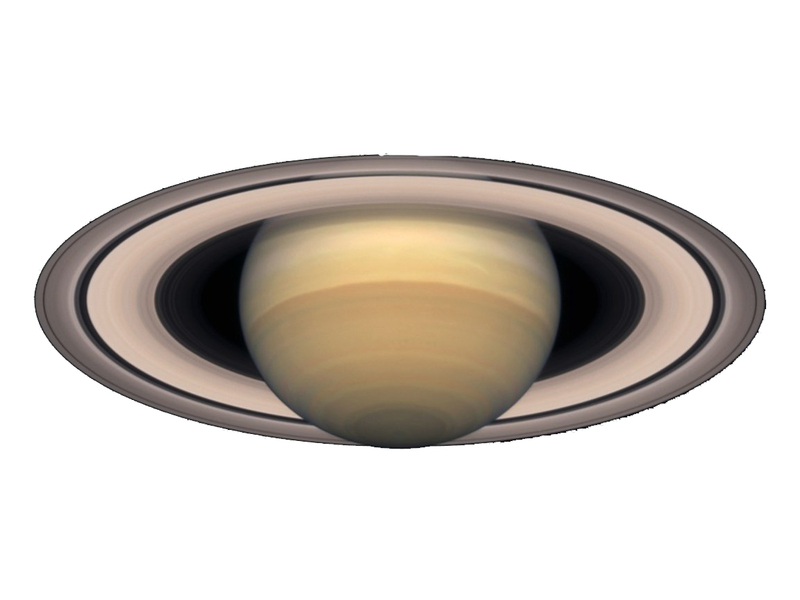 By the end of June Saturn will rise around midday and set around midnight. Saturn emanates a yellowish light, easily spotted between Regulus of constellation Leo and Spica of constellation Virgo, not far from Mars.Like Mars, Saturn also is becoming dimmer this month, around +1 magnitude, moving away from the Earth at an angle that will cause its rings to become thinner, reflecting less sunlight. 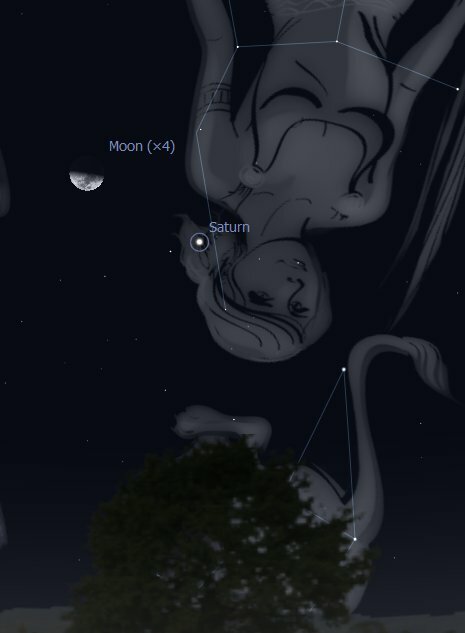 The Moon will be conjunct Saturn on June 18 (find snapshots in the June Calendar of Observable Events, below). The Eclipses, once again, accompany the change of season, a significant fact that will make their influence more marked and also longer lasting. The Capricorn Lunar Eclipse is Partial, visible after sunset from Australasia, and before sunrise in western South and North America. The Moon, central to the whole interpretation, is transiting in close proximity to Pluto in Capricorn, separated from the position of this planet, as projected on the ecliptic, by a mere 0 degrees and 41 minutes of longitude. The Sun then is of course exactly 180 degrees away from the Moon and also Pluto. Even by itself this configuration would heighten the intensity of the ecliptic Moon, but there is much more. Mercury is in Cancer with the Sun on the day, while Jupiter and Uranus, still conjunct in Aries, are 90 degrees away from both Sun and Moon; while Saturn in Virgo, opposite to them, is also in a wide 90 degrees angle to Sun and Moon. 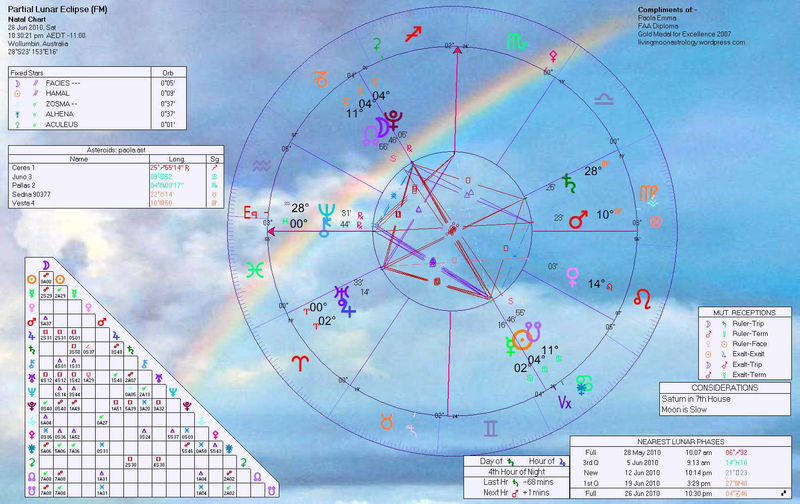 This configuration is known as a Grand Cross, usually connecting four celestial bodies, but, in this case, linking instead seven: Sun, Moon, Pluto, Mercury, Jupiter, Uranus and Saturn. Grand Crosses are tough, tight knots, forcing planets to work together, especially problematic if difficult planets are involved, as here are Saturn, Uranus and Pluto, heavy weights of the Zodiac. This Eclipse seems to draw attention and energize the knotty transits coming into activity during this season, the squares and opposition of Saturn to Pluto and Jupiter-Uranus respectively; more about these specific transits later. Some intensely emotional events can be the result of such a configuration corresponding with the time of an eclipse, because the combined forces of Jupiter and Uranus in Aries will create a fierce opposition to the might of Saturn in Libra and Pluto in Capricorn, also challenging each other: a time of quickening, a protracted labour inducing the birth of the New (a forceps birth rather than a gentle water birth). Unavoidably astrologers would notice the similarity between this event and the last lunar eclipse of 2009 (or first eclipse of 2010, depending where you were at the time), the one that preceded the Haiti and Chile’s disasters. The Sun and Moon were then placed in the Sign each other occupies in the June eclipse, on opposite hemispheres. The Sun was separating from a conjunction to Pluto and both Sun and Moon were widely square Saturn in Libra. But there is a great difference too. All Eclipses are grouped under one specific number, known as their Saros number. A Saros group begins with a particular eclipse; other eclipses follow, at an interval of 18 years approximately, all falling around the same degree of longitude. So, for instance, the Lunar Eclipse of June 26 2010 belongs to the Saros number 120. This group of Lunar Eclipses began with one that took place on October 5, 982 AD, close to the beginning of the last Millennium. The Eclipse that began a series is said to give its colour, tone and vibration to the lot of them. Therefore it is very important to study the first Eclipse of a Saros series to get a feel of what we are dealing with. This first eclipse of the series shows a highly charged Horoscope, but also one with many redeeming factors. The Saros number of the December eclipse instead began with an extremely difficult eclipse in 1000 AD, showing more clearly the potential destructive nature of all the following eclipses of the same number. For an in-depth reading of the major transits of Saturn and others, for the present and near future, please visit 2010 Forecast page. The different lighting of some of the pictures is due to the time the snapshots of the Planetarium were taken. JUNE 6: the Waning Moon, just past the Last Quarter Phase, will join Jupiter and invisible Uranus in the pre-dawn sky. The snapshot of this event was taken looking East, just before 6 am. 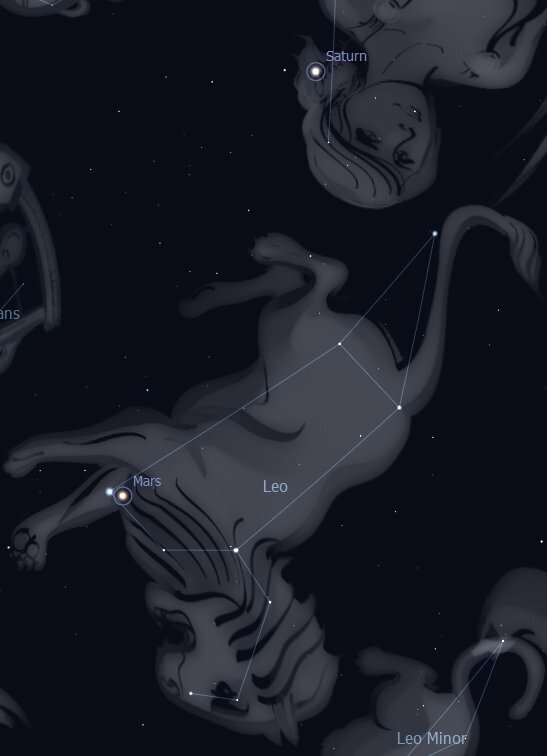 JUNE 6 and 7: Mars is today and tomorrow very close to the Star Regulus, the little King in the constellation Leo. 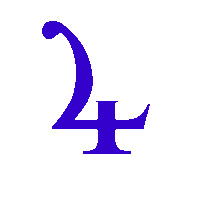 This is a great colour contrast, with red Mars and white-blue Regulus. The snapshot of this event was taken looking toward the North, at around 7 pm. In ancient times this conjunction would spell the violent or sudden death of a king or ruler. JUNE 7: Venus is setting very close to Castor, one of the Gemini Twin Stars. While Mars is s still very close to Regulus, the Little King Star (alpha of Leo constellation). A great time to observe Gemini and Leo Stars. Below is a snapshot of this event, looking toward the West around 6 pm. JUNE 15: Venus has now moved higher than Castor and Pollux, the Twin Stars, but the tiny Crescent Moon is joyning her in a beautiful display. Here is a snapshot of this event, looking toward the North-West, just before 6 pm. 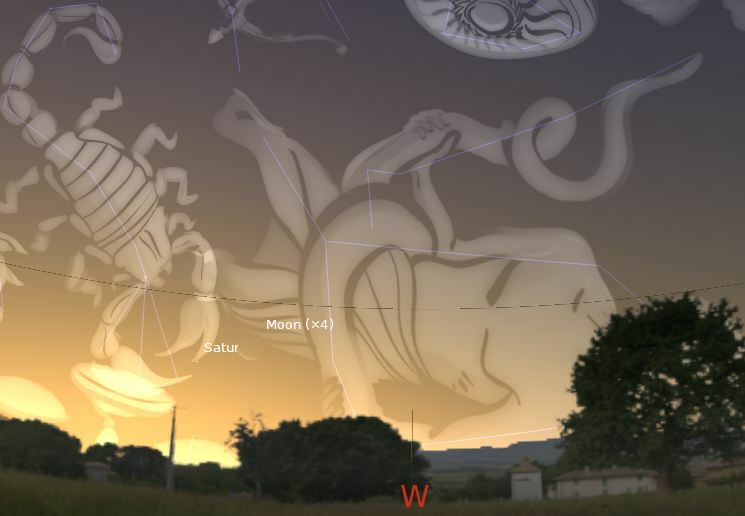 JUNE 17: the Moon will become conjunct Mars and Regulus tonight. This snapshot was taken looking toward the North-West, just before 7 pm. JUNE 18-19: the Moon will be close to the conjunction with Saturn over these two days, against the backdrop of the Virgo constellation. This snapshot was taken on June 19 around 10 pm. 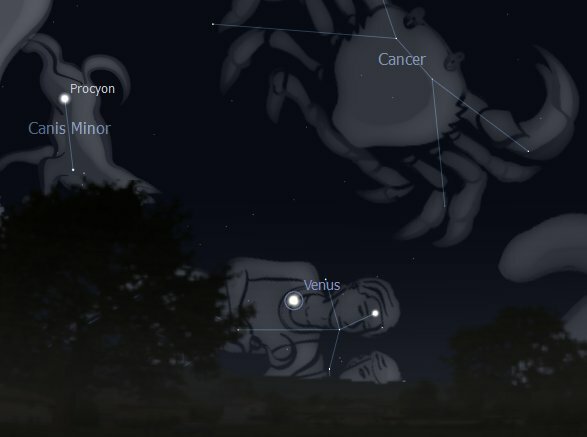 JUNE 20: Venus can be seen setting in the Beehive Nebula of constellation Cancer. Here is a snapshot of this event, taken looking toward the West, around 6 pm. 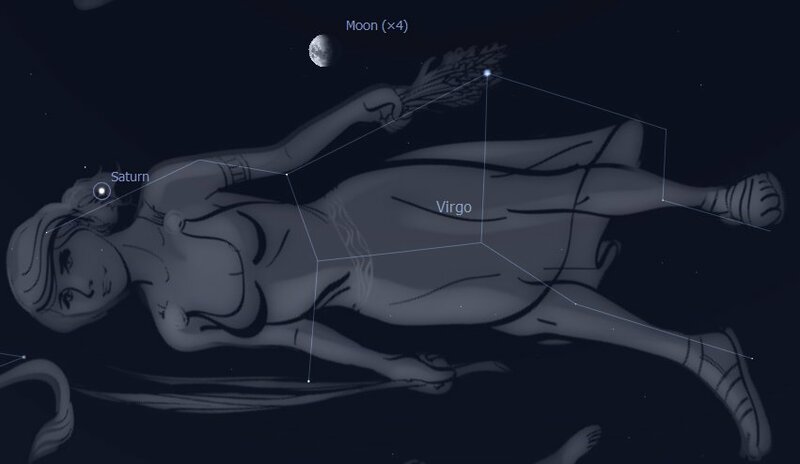 JUNE 20: the Moon is just 04 degrees far from Spica, the Ear of Corn Star in the hand of the Virgin constellation. Here is a snapshot of the event, taken looking toward the West, around 7 pm. JUNE 24: the Moon can be oberved very close to the alpha Star of Scorpio, Antares. The snapshot was taken, looking toward the North-West, just before 8 pm. 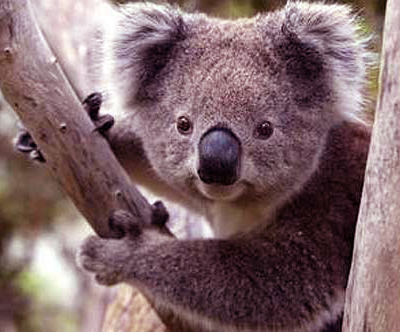 ALL APRIL INGRESSES and RETRO PERIODS = WAN. 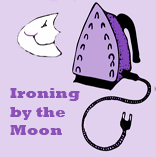 MOON = MOON in PISCES 2 Apr. 1:47 am - MOON in ARIES 4 Apr. 1:56 pm – WAX. MOON = MOON in TAURUS 6 Apr. , 11:06 pm - MOON in GEMINI on 9 Apr. 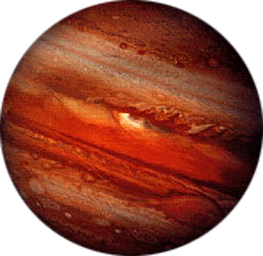 7:15 am - JUPITER turns RETROGRADE at 24°Sg21', 11 Apr. 3:00 am. JUPITER will turn DIRECT again at 14°Sg30', 13 Aug. 0.37 am - MOON in CANCER 11 Apr. 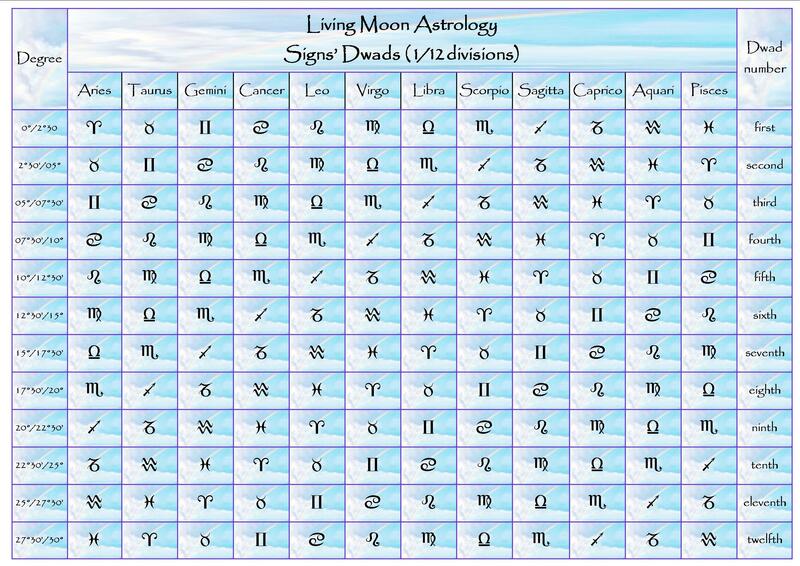 1:31 pm - MOON in LEO 13 Apr.5:50 pm - MOON in VIRGO 15 Apr. 8:13 pm - MERCURY in ARIES 17 Apr. 4:00 pm. 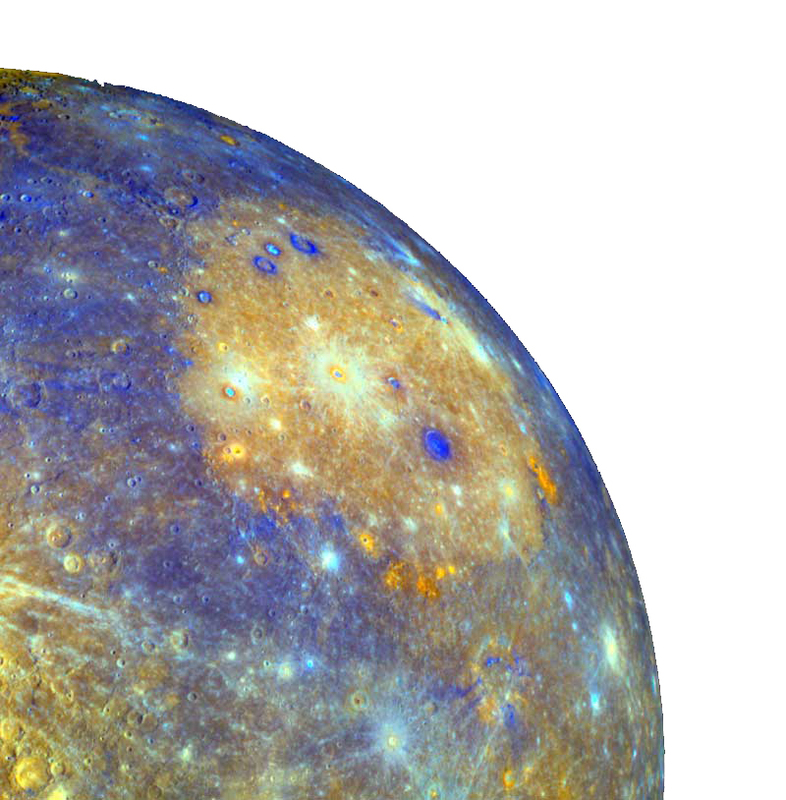 MERCURY will transit ARIES until 7 May, 5:25 am, with Ingress into TAURUS - WAN. 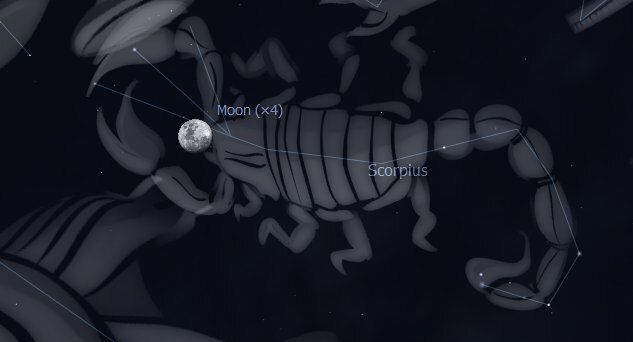 MOON = MOON in SCORPIO 19 Apr. 10:40 pm - SUN in TAURUS 20 Apr.6:55 pm - VENUS in ARIES 17 Apr. 4:00 pm. 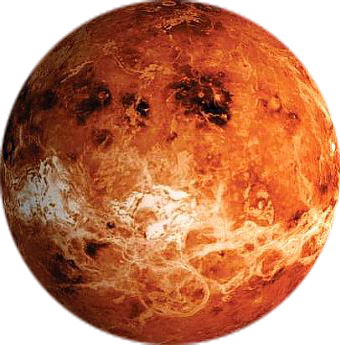 VENUS will transit ARIES until 15 May, 8:45 pm, with Ingress into TAURUS - MOON in SAGITTARIUS 22 Apr. 1:59 am - MOON in CAPRICORN 24 Apr. 8:49 am - PLUTO turns RETROGRADE at 23°Cp09', 25 Apr. 4:47 am. PLUTO will turn DIRECT again at 20°Cp38', 4 Oct. 5.49 pm - MOON in AQUARIUS 26 Apr. 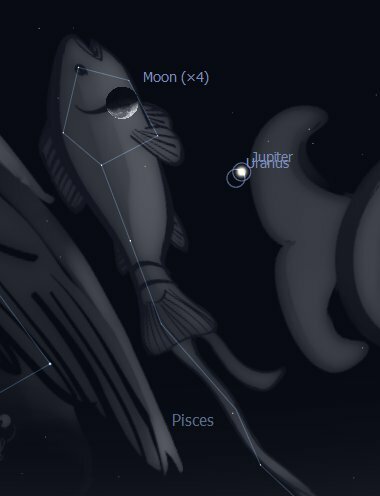 7:27 pm - MOON in PISCES 29 Apr. 8:11 am - SATURN turns RETROGRADE at 20°Cp31', 30 Apr. 10:54 am. SATURN will turn DIRECT again, at 13°Cp54', 19 Sep. 7.47 pm.